Let's look at the market's performance on 8th April, 2019. The top sale of the day was Office.org which sold for $22,000 at Sedo. NameBio recorded 292 sales $100+ for a total of $166,403 with an average sale price of $570. Compared to the previous day there was an increase of 3% in the number of sales and the total dollar amount increased by 26%. We also recorded an additional 1,079 sales below $100 for a total of $28,383. The domain SameHour.com sold for $319 at DropCatch for a decrease of 73%. It last sold for $1,200 on March 25th, 2013 at Afternic. The domain DIYStudios.com sold for $230 at DropCatch for a decrease of 85%. It last sold for $1,500 on August 11th, 2017 at BuyDomains. 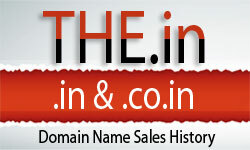 The domain Symboli.com sold for $250 at NameJet for a decrease of 88%. It last sold for $2,000 on November 14th, 2018 at BuyDomains. The domain Noteables.com sold for $159 at NameJet for a decrease of 95%. It last sold for $3,200 on November 4th, 2012 at Afternic.